The Fog of War is a 20th century fable, a story of an American dreamer who rose from humble origins to the heights of political power. Robert S. McNamara was both witness to and participant in many of the crucial events of the 20th century: the crippling Depression of the 1930s; the industrialization of the war years; the development of a different kind of warfare based on air power and the creation of a new American meritocracy. He was also an idealist who saw his dreams and ideals challenged by the role he played in history. Although strictly speaking, neither a work of biography nor a work of history, The Fog of War has produced important, new biographical and historical material. First, although there have been several book-length biographies of Robert S. McNamara and many books in which he is a principal figure, none have discussed the pivotal relationship between McNamara and General Curtis LeMay, the infamous U.S. General, and their involvement in the firebombing of 67 Japanese cities in 1945. World War II is thought of as a just war. It is believed that the Allies fought on the side of good, and that what they did in their wartime effort was justified by that fact. What few people know is that before the United States dropped the two atomic bombs on Hiroshima and Nagasaki, LeMay’s B-29 bombers had already killed nearly 1 million Japanese civilians, including 100,000 in Tokyo on the night of March 10th, 1945. Second, for many people who are familiar with the Cuban missile crisis from the movie Thirteen Days, The Fog of War tells a very different story. Here is a story not about how John or Bobby Kennedy saved the world, but a story of blind luck, caprice and the limits of rational judgment. A story of a world out of control, where a nuclear holocaust was averted by an obscure state department official who had the temerity to speak up to the President and to urge him to empathize with his adversary. 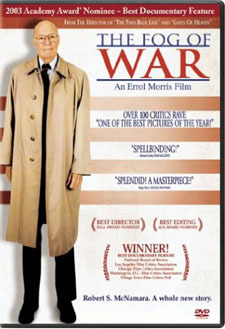 Third, The Fog of War is the first historical investigation to make extensive use of taped telephone conversations from the Oval Office of the White House between Johnson and McNamara. Much of what has been written about Robert S. McNamara rehashes a familiar story-that of a computer-like man, a technocrat, a hawk who, through his arrogance, blundered into Vietnam. However, the presidential recordings – the weight of the historical evidence itself – do not bear this out. Instead, a far more complex portrait of the man emerges-one who tried to serve two very different presidents: John F. Kennedy and Lyndon B. Johnson. We hear McNamara explaining to Kennedy the need to set a timetable for removing advisors from Vietnam; we hear Johnson (after Kennedy’s death) admonishing McNamara for his unwarranted optimism in giving such advice; we hear McNamara urging Johnson to put the breaks on the bombing of North Vietnam; but, in the end we hear McNamara endorsing the President’s wish to continue the war. Sony Pictures Classics Presents a @radical.media and Senart Films Production in Association with the Globe Department Store. Producers: Errol Morris, Michael Williams, Julie Ahlberg. Co-Producers: Robert Fernandez. Executive Producers: Jon Kamen, Jack Lechner, Frank Scherma, Robert May, John Sloss. Directors of Photography: Peter Donahue, Robert Chappell, Editors Karen Schmeer, Doug Abel, Chyld King. Production Design: Ted Bafaloukos, Steve Hardy. Director of Photography: Robert Chappell. First Assistant Camera: Joe Christofori. Second Assistant Camera: Tim Sweeney. Production Sound Mixer: Steve Bores. Director of Photography: Peter Donahue. Production Supervisor, China: Sarah Gold. Production Coordinators: Dina Marie Piscatelli, Kevin Hayes. First Assistant Camera: Bob Ragozzine, Eric Zimmerman, Greg Daniels. Second Assistant Camera: Daisy Smith, Brett Van Ort. Assistant Sound Editor: Marilyn Teorey. Recordists: Harry Higgins, Terry Laudermilch. Soundtrack available on Orange Mountain Music. Soundtrack CD produced by Don Christensen. All Philip Glass music published by Dunvagen Music Publishers Inc. (ASCAP). Additional Philip Glass Music courtesy of Dunvagen Music Publishers: Dance I (In the Upper Room), Company I, Company IV. In memory of Harvey Goldberg and George L. Mosse, my history professors at the University of Wisconsin. Copyright © 2003 Sony Pictures Classics Inc.